The latest release from Cid Inc’s Replug Records welcomes Dmitry Molosh to the label for his debut EP. The Belarus based artist is coming off the best year of his career in 2015. Dmitry’s modern approach to progressive music caught the attention of Hernan Cattaneo and Guy J, both of whom played and charted several of his productions throughout the year. 2016 holds great promise as well with forthcoming material signed to Guy Mantzur’s Plattenbank Records. 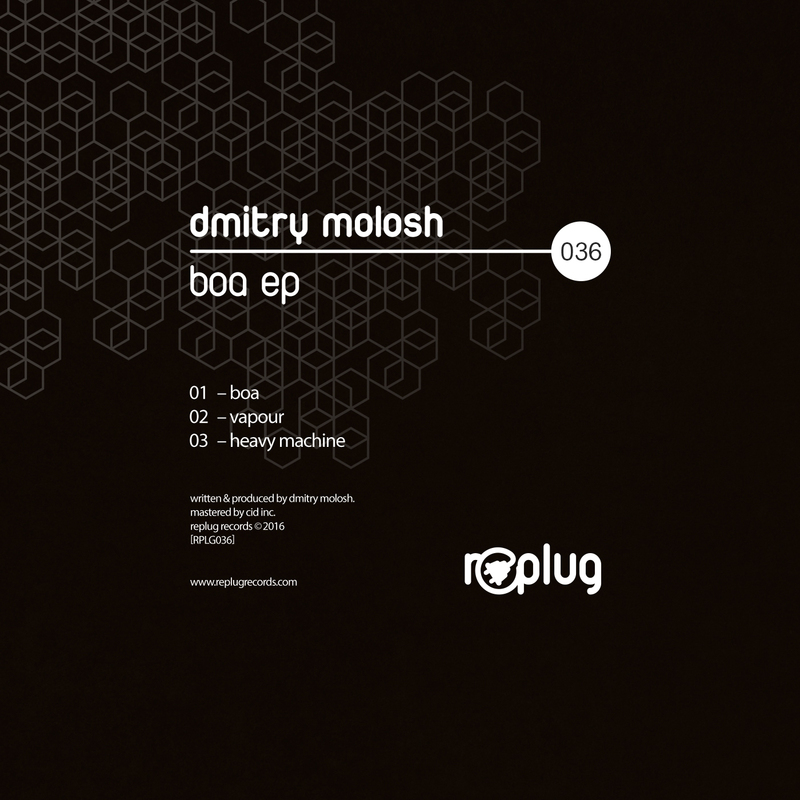 Beginning the new year in style Dmitry now presents his debut EP for Replug Records entitled ‘Boa’. Dmitry’s tightly constructed grooves and smooth rhythmic cadence were one of the underground’s true sonic delights last year. The lead track ‘Boa’ stretches those boundaries further and might just be his finest work to date. Anchored by a pair of offset bass stabs and distinctive kicks, Dmitry begins to take you on a journey through the dark realms of progressive techno. Mystical sweeps complement the electronic underbelly, before a wall of white noise reveals a tonal theme and rugged lead line. It’s boundless energy carries it with ease into the main break, where a sequence of sonic decay precedes an impactful build, ultimately reigniting the groove for a stellar finish. The EP’s second selection ‘Vapour’ finds Dmitry unleashing a large peak time creation that’s full of unique design qualities. Bulging bass swells, trailing effects and a lone acid line set the piece in motion, while waves of percussion and a galloping groove lay down a mesmerizing vibe. As the first act peaks, indistinct vocals and grinding electronics converge for a psychedelic audio collage, further obliterating the senses. The tracks centrepiece is another highlight with its intense acidic build and heightened state of mind. It all amounts to another huge finale from the Belarusian artist, guaranteed for dance floor success. The release concludes with ‘Heavy Machine’, which finds Dmitry exploring peak time territory with one of his most techno inspired creations to date. Backed by the EP’s most ferocious groove, it sits nicely alongside the previous two cuts as a more energetic complement. Once again Dmitry carves out a beefy foundation and scintillating designs, before eerie vocal elements pierce the air while clusters of claps add further electricity to the mix. The vocal storyboard continues into the break where the mystical surroundings converge for an amazing moment, making for an unforgettable conclusion to the release. For a producer that had an amazing year in 2015, Dmitry has certainly raised the bar with this three track collection. Already a highlight in many of Cid Inc’s recent sets this is one EP that you don’t want to miss.